Work on the AirMule prototype is continuing at our facility in preparation for resuming flight testing before the end of 2010. 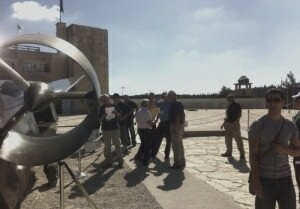 This AirMule prototype was recently displayed at the Latrun 2010 Conference (Fighting in Urban Terrain) in Latrun Israel. So far the AirMule prototype has performed 40 test hovers and accumulated 10 hours of flight time. Currently, the aircraft is undergoing a systems upgrade including the development and installation of wheeled landing gear. 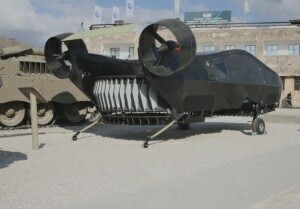 The wheeled landing gear will facilitate ground mobility while also enabling STOVL (Short Takeoff Vertical Landing) operation which has the potential to nearly double the aircraft's payload capacity due to the unique aerodynamics of the AirMule. Integration of newly installed position-hold sensors (laser altimeters, differential GPS) into the flight control system. Optimizing the flight control laws for achieving the highest stability and position accuracy, even in non-zero wind conditions. Running-in the AirMule’s mechanical transmission system and lift rotors. Gaining more flight experience with the vehicle’s vane control system under actual full-scale induced velocity conditions which these tests are facilitating. We will update this page once the AirMule is in completely free hovers. At that time we plan to also post a video on the website. The AirMule (formerly MULE), a single-engine, VTOL Cargo and MedEvac UAS developed by Urban Aeronautics, Ltd, has successfully completed the first phase of its flight testing. This phase has consisted of autonomous hovers with the vehicle’s Fly-By-Wire control system providing the necessary auto-stabilization in all three rotational axes of the vehicle (Pitch, Roll and Yaw). Control of the vehicle is accomplished through a company developed, four channel, redundant flight control system that relies almost entirely on inertial measurements augmented by GPS for translational position and velocity readings. Height above ground is measured by two laser altimeters. 460 channels of telemetry provide real-time data to the ground based operators, enabling them to monitor the correct operation of the Turbomeca Arriel1 730 horsepower turbo-shaft engine as well as sub-systems. These include the three company developed gearboxes, the two main lift rotors with their hydraulic pitch change mechanism and three uplink and downlink communication channels. 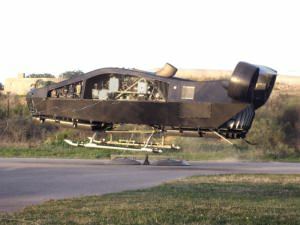 Results from the tests have confirmed the company’s predictions regarding power required for hover. The present hover height of approximately 60 cm (2 feet) is just outside of ground effect for this particular configuration. Based on an initial assessment of the vehicle’s available control power under actual conditions it has been demonstrated that the AirMule’s vane control system which is used for roll and yaw control is already generating in excess of 2.0 Radians/sec^2 of roll acceleration. This figure is expected to double in the future with additional improvements that are presently being implemented. The significance of these results is the vehicle’s ability to perform hover with very high precision in gusty wind conditions (currently estimated and confirmed by the recent hover tests at 50 knots for the fully developed product). Based on the success of these initial hover tests the vehicle is now being readied for the next phase which will include vehicle position stabilization in X,Y and height above ground. During this upcoming phase the safety wires that are now connected to the tarmac will be removed. Urban Aeronautics Ltd, is the world leader in developing Fancraft technology. Urban is developing a family of internal rotor (modified ducted-fan) aircraft based on its extensive portfolio of proprietary technologies. 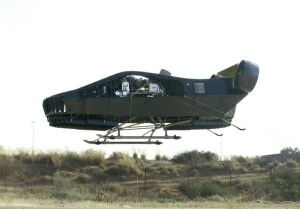 Due to their internal rotors, compact design and revolutionary 'six-degrees-of-freedom’ mobility, these aircraft are uniquely suited to flight inside of cities and other obstructed environments where both fixed wing aircraft and traditional rotorcraft are unable to operate.. Urban’s flagship model, is the AirMule Cargoand MedEvac UAS.